Who Decided to Throw the Ball Late in the Fourth Quarter Sunday? After stagnating all afternoon following the first quarter, when they capitalized on a couple short fields following turnovers, the Ravens offense looked to have finally come alive with about seven minutes remaining in their 20-13 Divisional Playoff win over the Houston Texans. In seven plays, they had moved the ball from their own 29 yard line to the Houston 31 on the strength of a few nice Ray Rice runs and completions from Joe Flacco to Anquan Boldin, Torrey Smith, and Dennis Pitta. Leading 17-13 at the time, the Ravens had also managed to bleed precious time off the clock during the series. On first and 10 from the Houston 31 with just 3:09 remaining, Rice ran for five yards to set up 2nd-down and five. At this point, Texans head coach Gary Kubiak decided that he couldn’t let any more time run off the clock, and used his first time out. 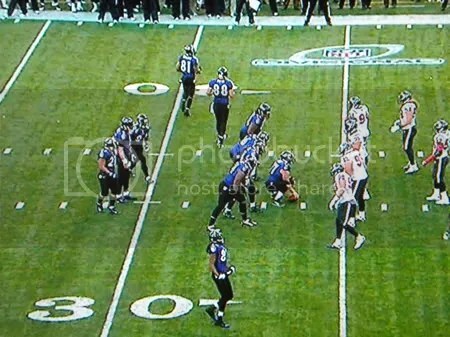 While the Ravens were already in field goal range, and a successful attempt from Billy Cundiff would give them a much more comfortable seven point cushion, another first down or two would really put the pressure on Houston. With the Texans already declaring that they were going to use their time outs to stop the clock, it would have been in the Ravens’ best interest to take them up on that offer, by forcing them to continue to burn them. Runs on second and third down would either A) result in Houston being completely out of time outs, B) take the clock down to at least the two-minute warning, or C) some combination of A and B. Instead, the Ravens passed on both downs, and both plays resulted in incompletions and Baltimore giving Houston the gift of a stopped clock. With the way the end of the game ultimately played out (with a last second heave to the end zone by Texans’ QB T.J. Yates, on which Ed Reed was at least a little banged up), those ~80 seconds (or two timeouts), could have been absolutely critical. At the time, Ravens fans – myself included – were falling back upon our old reliable scapegoat, Cam Cameron. What the hell was Cam thinking? Had he not learned his lesson about feeding Ray Rice the ball after all that’s happened this season? Checking to a pass? That’s what Harbs says. What do you think? However, following the game, Ravens’ head coach John Harbaugh said that it was Flacco, not Cameron, who was to “blame” in that particular situation. Coach John Harbaugh said QB Joe Flacco checked into pass plays on the second- and third-down plays with just over two minutes remaining in the game. Harbaugh said Houston lined up and showed all-out run blitzes, which forced Flacco to check to a pass, even if an incompletion would stop the clock. I went back and re-watched the sequence on my DVR, and I have to say – I see absolutely no indication that Flacco is making any kind of check or audible call at the line on second down. While it’s entirely possible that I am missing some subtle gesture or call that Joe is making, I just find it hard to believe that he could have changed the play without showing any of the outward signs we’re used to seeing from quarterbacks checking into or out of plays (with Joe, we’re used to him tapping his rear and yelling “Alaska, Alaska” for instance). On third down, it looks like he says something to both Ed Dickson and Ray Rice as they are lined up with him in the shotgun, but again…a shotgun formation would typically indicate that a pass had already been called. Our feelings on both Flacco and Cameron are well documented here at the Nest. While our obvious gut reaction is to blame Cam for these gaffes, we have to at least consider Harbaugh’s words. Harbaugh, though, has been known to be pretty defensive of his offensive coordinator. Could he just be covering for Cam? If he is, it would come at the expense of throwing his quarterback under the bus. If he doesn’t, then we have to direct our criticism to Flacco. If Joe really did change to passing plays under his own volition in that situation, I am extremely disappointed in his decision-making – more so than I am of anything he physically did on Sunday. While I admire the fact that he decided he wanted the ball in his hands there, with the game on the line, he needs to put his ego aside, turn around, and hand the damn ball to Ray Rice. Where you come down on this issue will probably align fully with who you typically blame for the Ravens’ offensive woes – those Ravens fans who – like me – blame Cam, will say that Harbs is probably covering for him. Those that are anti-Joe will use this as more ammunition in their argument that the Ravens should not sign #5 to a new contract. Either way, somebody royally screwed up late in the game Sunday, and we’re all lucky that it didn’t cost the Ravens the game. We have to hope that it didn’t cost them their starting Hall of Fame free safety as they prepare to face one of the best passing attacks in the NFL. This entry was posted on January 16, 2012 at 5:24 pm and is filed under Ravens. You can follow any responses to this entry through the RSS 2.0 feed. You can skip to the end and leave a response. Pinging is currently not allowed.